Home » Mass Workout: How to Get BIG (Part 2)! Mass Workout: How to Get BIG (Part 2)! Now it’s time to put everything together! If you are unfamiliar with any of these exercises, we’re going to go over their proper execution in detail. 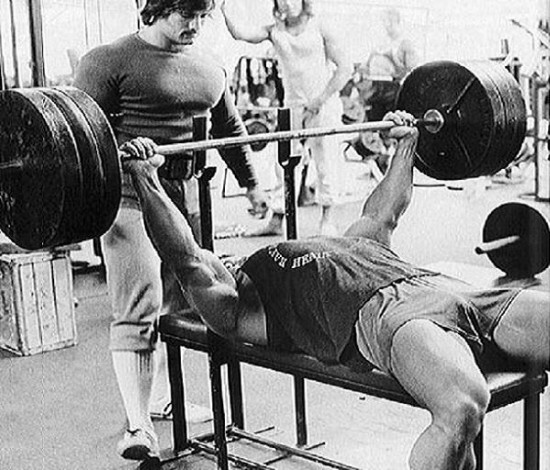 The Bench Press is primarily for the chest, and is performed flat on a bench, with your barbell placed within easy reach on a support rack. You may place your feet up onto the bench to allow for a little extra lower back support. Using a shoulder width grip, remove the barbell, and bring down to the upper part of your chest in a controlled fashion; then raise it back to the beginning position. The Clean and Press works your upper back and shoulders and is performed on a flat surface, with plenty of room around and above you. With the barbell placed on the ground, place your feet placed slightly farther than shoulder width apart. Bending your knees slightly and keeping your back straight (not arched) for the duration of the exercise, reach down and grab the barbell palms faced down. Pull up the barbell until it is resting in your palms along the same height as your shoulder blades, this is called the “clean”. Now take the barbell and perform the “press”, by lifting it above your head, and then lowering it back into resting position parallel to the shoulders. Finally, lower the barbell back to the beginning position. The key to this movement is the snap that is performed during the clean portion of the exercise. With a fair amount of weight, you will find that you will need to snap your palms from facing you in a knuckles down position, to a facing away from you in a knuckles up position. Once the snap in mastered, you’ll increase your weight two-fold. The Close-grip Bench Press concentrates on your triceps muscle, and is performed with the exact same motions as the Bench Press, except now your hands should be placed in the center of the bar, as near touching as your comfort will allow. You will also have to bring the bar closer to the center of your chest to allow for a safer and more secure grip throughout your repetitions. Bent-over Rows work your lat muscles on the sides of your back, which give you a V-shape. This exercise is executed standing on a flat surface with the barbell placed in front of you, resting on the floor. Grab a bar shoulder width apart, and position you’re back parallel to the floor. Maintaining this opening position, slowly raise the barbell to the center of your chest, and then lower it back towards the ground. Barbell Curls are great for building your biceps, and this exercise is performed standing with a barbell in your hands, with your palms facing away from your body. With your elbows secured at a pivot point on your hip (do not allow them to move from this position), slowly raise the barbell until it is just under your chin, and then return to the beginning position. This exercise can allow for a slight swinging motion for the last rep or two in order to blast past any sticking points. However, in general, keep your overall form strict. 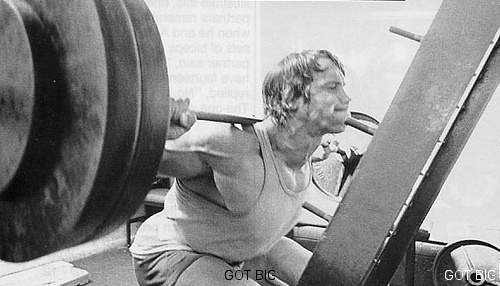 The Squat is performed with a shoulder height rack with feet shoulder width apart. 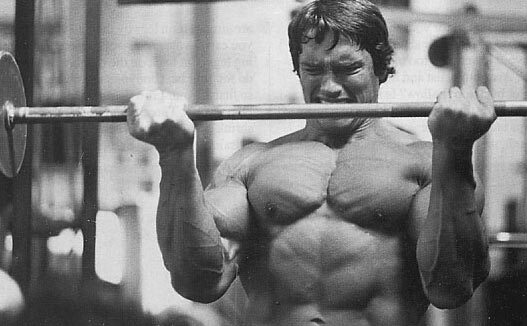 Place the bar behind your head, resting on your shoulders, and lift the bar off the rack. Slowly squat down, making sure you are keeping your back straight. When your thighs are positioned parallel to the floor, raise the bar back to the beginning position. Refrain from locking out the knees during the upstroke of the exercise, as this can risk injury to the knee. 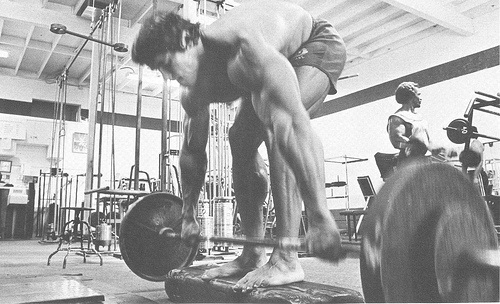 Stiff-leg Deadlift is for the lower back and hamstring muscles and should be executed with the utmost strict form. Begin similar to that with the Clean and Press, with a loaded barbell placed on the ground in front of you. Keeping your knees slightly bent, pick up the bar and raise it up to your hip; your back should be completely erect and straight at the completion of this first movement. Hold this position for about two seconds, before returning once again to the beginning position. Standing Calf Raises are performed with a special machine designed for this purpose. However, if all else fails, you can also use a barbell to perform this if that is all you have access to. Place the pads of the machine on your shoulders, and the balls of your feet on the edge of the platform. Place your feet at a variety of angles from toes pointed in, to toes pointed out, and give your calves a good stretch at the bottom of the movement. At the top of the position flex the calves for about 2 seconds. Be strict with yourself, and follow this routine religiously everyday. Always challenge yourself to improve with each workout, whether it is in the weight used, or strictness of form applied. Stick to it at least two to three months. It is the amount of determination you have dedicated to you goal to getting big that will be the deciding factor of your overall success! 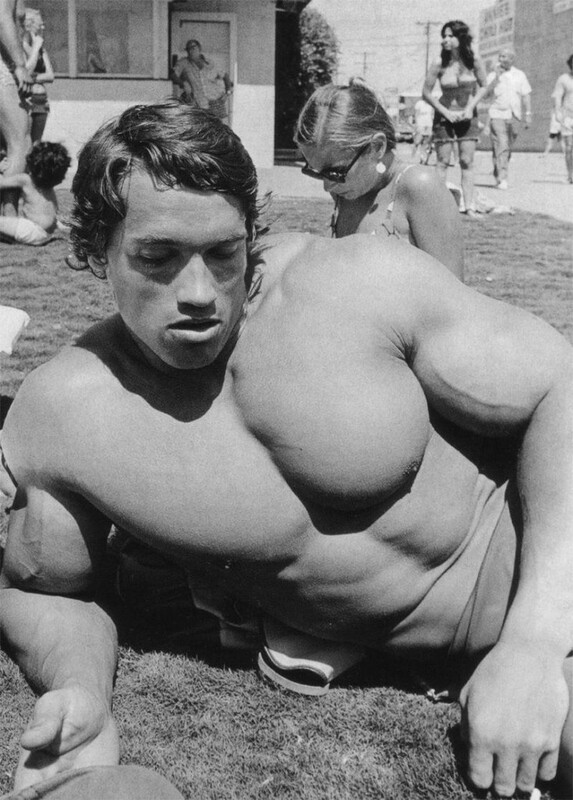 Read Part 1 of How to Get Big!